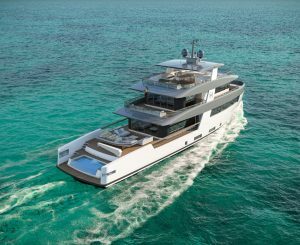 Rosetti Superyachts two new tri-deck designs focus on maximum use of the main deck for transporting tenders and toys without sacrifice to luxury interiors and accommodations. Interior general arrangements offer an owner’s stateroom on the upper deck with gorgeous 180-degree views and a private terrace. There’s even an infinity pool beneath the mini submarine. 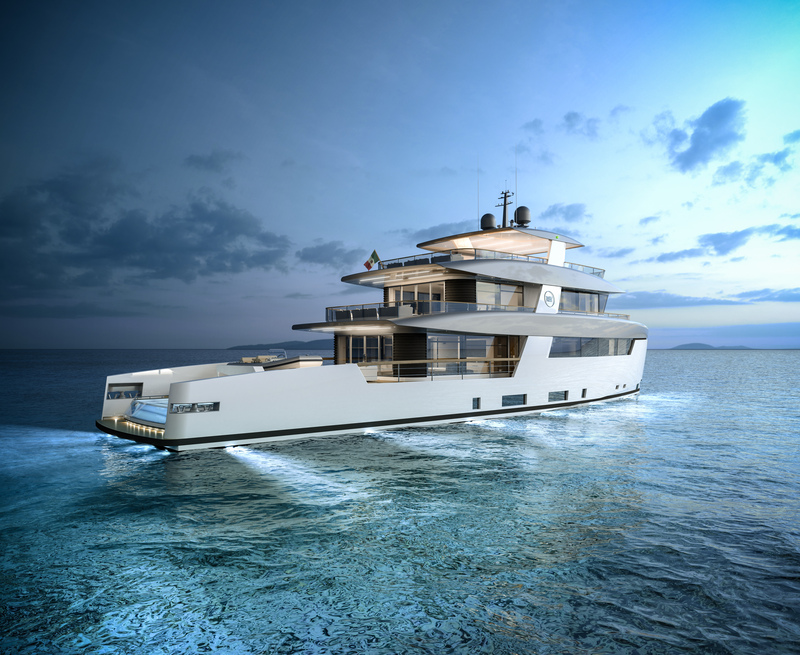 Two new tri-deck concepts by Giovanni Ceccarelli augment Rosetti’s range of supply vessels. Ceccarelli is an experienced yacht designer who has specialized in legendary sailboat designs. His many notable achievements include roles as chief designer of Mascalzone Latino, the 2003 America’s Cup contender, and +39 Challenge that competed in the 2007 Louis Vuitton Cup. A life-long sailor, Ceccarelli is old school. When he begins a new design for a shipyard or owner, he starts from scratch with a hand-drawn sketch. Both new concepts feature innovative design solutions. Steel hull forms are constructed to provide low hydrodynamic resistance. They rely on similar processes used in the design of racing sailboats. The superstructures are aluminum, with composite materials used for the top deck. This ensures optimal weight distribution. A low center of gravity reduces motion and increases comfort under way. 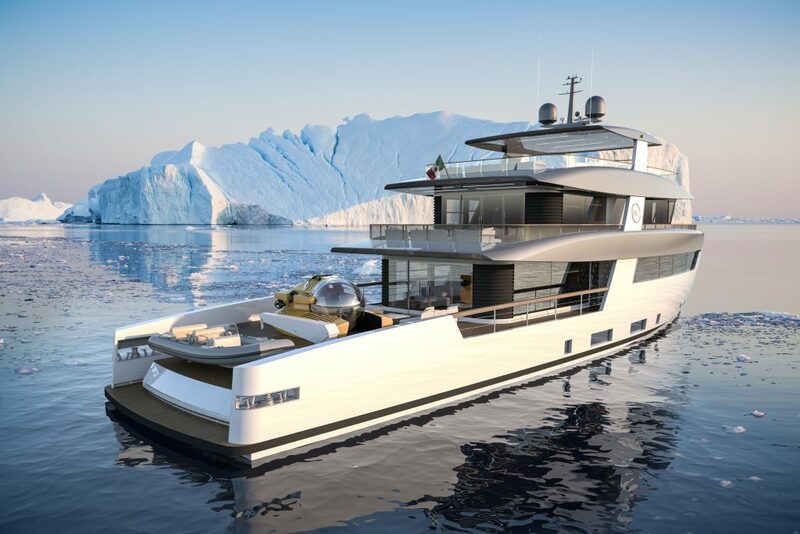 The 115’ concept has a 27’ beam with space on the main deck aft for stowing a tender with accompanying crane. There is also a 72-square foot infinity pool. Alternatively, with the pool covered, there is room for a mini submarine in addition to the tender. Inside, there is a spacious main salon with dining area and forward galley. The galley is accessible directly from the crew quarters. 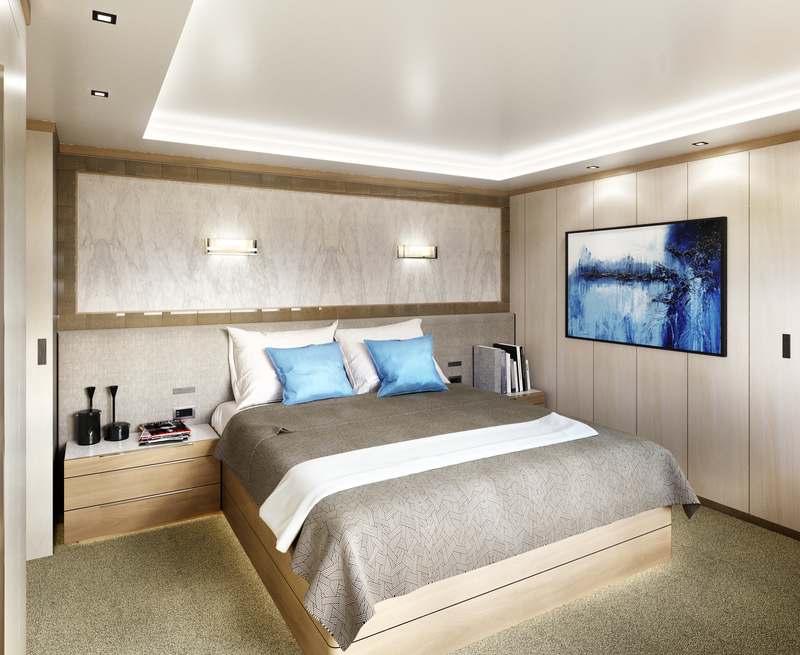 Below deck, four ensuite cabins provide comfortable accommodation for eight guests. The upper deck is dedicated to the owner’s private use. The master stateroom, bathroom and walk-in wardrobe are located aft and provide wide vistas of the sea over the private terrace. 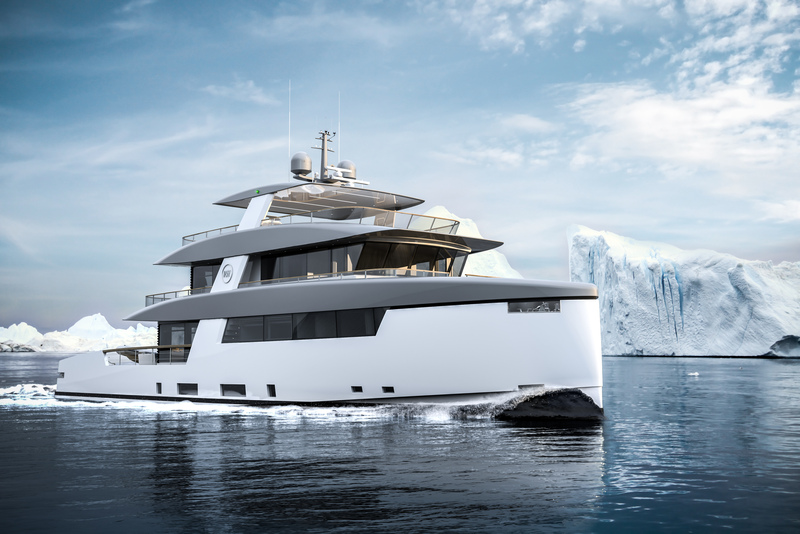 The 164’ concept has a beam of nearly 32-feet, which offers even more interesting layout solutions. For example, the main deck is arranged on two levels. It covers a total area of 1,830 sq/ft, including a 140 sq/ft infinity pool and expansive beach club. The heated pool becomes a lavish hot tub in colder climates. Various toys, or even a mini submarine for underwater exploration, fit neatly on deck. The tender is housed inside a dedicated garage. Like the 115’ concept, the main deck features a generous open-plan lounge and dining area separated by the staircase and integrated bar unit. 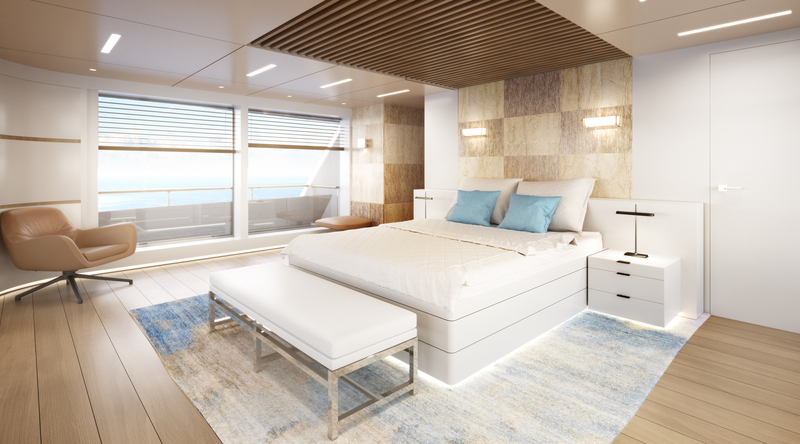 Again, the owner’s suite is located on the upper deck overlooking the aft deck. The sun deck features a Jacuzzi, dining and relaxation area. Both designs have a gross tonnage below the 500GT threshold. Powered by twin MAN main engines, (1,000hp and 1,400hp each for the 115’ and 164’ respectively) they offer comfort and efficient performance at displacement speeds. Rosetti Superyachts specialize in the construction of steel and aluminum superyachts, explorers, support and supply vessels from 115-450-feet. These two new projects handsomely showcase the company’s design philosophy and brand mission. 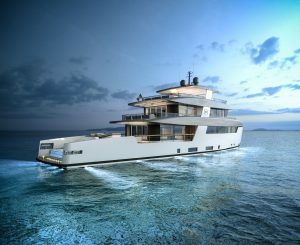 Contact Select Yachts Brokers for more information about Rosetti Superyachts or to charter the yacht of your dreams. Select Yachts, select charters, worldwide.